Albuquerque The Magazine – July 2013 /Hawks Aloft Inc. Check out the July 2013 issue of Albuquerque The Magazine. There’s a great article featuring our citizen scientists and all that they do for us. It also features Charles Cummings, one of our ace volunteers! 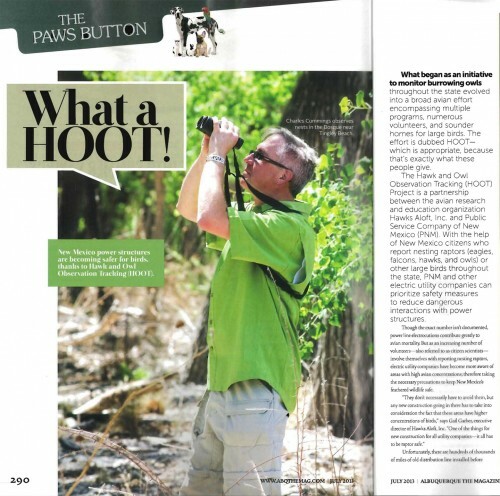 The article highlights the HOOT program (Hawk and Owl Observation Tracking), which is a partnership between Hawks Aloft and PNM. We are aided by New Mexico citizens who report raptor nests throughout the state. They often monitor the sites for us as well. PNM uses the information to help reduce dangerous bird interactions with power lines. Hawks Aloft uses the information about where raptors are nesting and how successful the nests are. But most importantly – the people who discover and monitor the nests for HOOT become advocates for “their” birds. Please buy the July issue of Albuquerque The Magazine and read more about the HOOT project. You can also read about it on our website.